So in your opinion, which of the two final American gigs is the best one? They're roughly equal, although that isn't saying much. There are plenty of other '77 performances I'd recommend before bothering with these two. The recent compilation from 2 sources separates the wheat from the chaff, as they say. 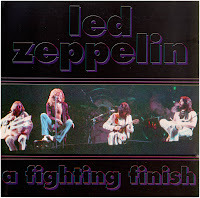 There is no longer any debate, this 7-24-1977 show now holds the spotlight it so richly deserves, last performance in the U.S. and all the backstage Bonzo, Richard Cole and Peter Grant's son "history". It is now complete, minus 5 or 6 seconds at the intro of "Evermore", and in brilliant remastered sound quality.